With this document, you also have the right to make your own healthcare decisions or have someone else make them for you. The advance health care directive lets a principal specify what sort of treatment to receive in the event he or she becomes unable to make decisions about his or her own healthcare. 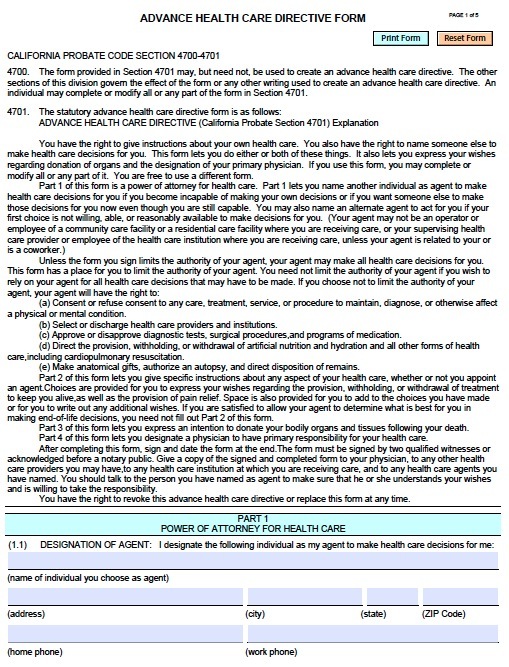 In California, you can elect to give your health care agent the power to consent to any treatment or service to diagnose or maintain any mental or physical condition. Most prominently, this document governs whether you will or won’t be kept on life-sustaining treatment. Cementing your wishes in a legal document can spare loved ones some anguish if you develop an irreversible, terminal condition that will result in death shortly. You can also specify whom you want as your primary physician, whether you would like to donate your organs, and how to dispose of your remains. Again, your healthcare agent should be someone you trust who understands your values, like a close family member. Step 1 – Complete the form and registration document.